That's right...only 100 more days until baby Shock's arrival. Actually, Daddy has taken a liking to Shock Jr., so I may start referring to him that way. I've made it through 180 days, so what's another 100? Seems like a long time, but technically it's just over 14 weeks or close to 3 more months. Whoa. No new updates at the moment. Shock Jr. is a pretty active kicker. He likes to wake up with Mommy and then kick her to sleep at night. The semester is almost over, so I should start my painting project in the nursery at the beginning of May. I'll post pictures of the progress once I begin. Shock Jr. has been to his first Spurs game and walked in a parade (in-utero of course). I have a feeling he will get to do many cool things with Mom and Dad. I went in for the 24 week check-up and everything is going great. I am right on track with weight gain and all my vitals are in tip top shape. They measured the belly and it seems that baby is growing right on time. Baby Shock's heartbeat sounded great. I always love hearing that little "pac-man" heartbeat on my routine visits. Next appointment I get to take the dreaded glucose test. What is so bad about drinking a sweet drink and then getting a good hour of quality reading time? 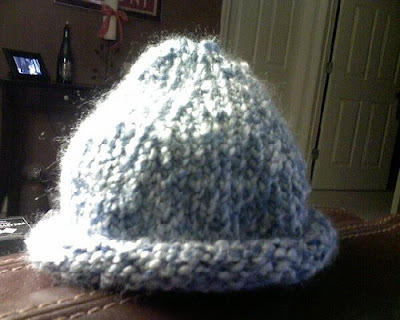 Well, I thought I was done knitting hats until I started digging in my knitting bag and found some left over chunky baby blue yarn. Well then....of course I had to see what I could make with it. I found a very easy pattern online to follow this time. 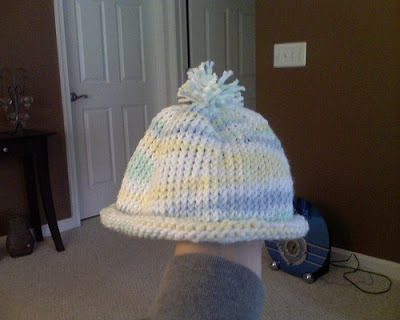 This hat came out smaller, which means baby Shock can actually wear it sooner. I may even put this one on him for his baby picture. I also finished my nursing cover. Some may know these as "hooter hiders." It is basically an apron with an adjustable neck strap that you can cover yourself with while you breastfeed. That way you won't get any ogling or dirty looks while you feed baby. I'm not shy by any means, but I don't want to deal with any dirty looks. I am amazed at how much stores charge for these things. Now I really sound like my mom, "We don't need to buy that, I can make it!" 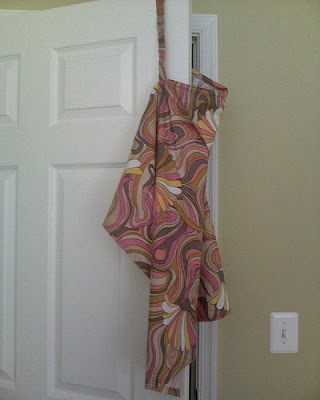 I was inspired by Louise to try and make my own Moby wrap (Especially since it is basically one long piece of fabric). I also decided to try and make my own nursing cover. I looked online for all the dimensions I needed and headed over to G-Street Fabrics. This was my first time in the store and I was like a kid in a candy shop! I think I may be going there more often. They have a killer remnant table where everything is $2.79 per yard. As soon as I walked in, I was greeted by a very helpful lady who walked with me around the store giving me ideas and helping me dig thru the remnant table. So I spent $20 total for fabric and supplies to make my wrap and cover. This is a bargain considering the moby runs about $40-70! I finished the wrap last night. I added a panel (when you buy a moby with the panel, the price goes up about $20) for the front for a little more stability. I tried putting the cat in the wrap, but that was not such a bright idea (kitty has claws). 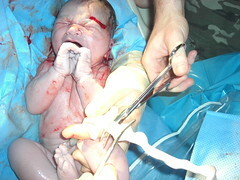 So I'll have to wait until Baby Shock is born, unless someone lets me borrow their baby. Here is my first creation, the Shock-Wrap :) I'll start the nursing cover soon. I got to work this morning and I had a gift bag sitting in my chair. A coworker knitted a baby blanket for Baby Shock! It was a nice surprise and I'm sure it will keep him very warm. Best of all, it is machine washable and dryable. I am so very fond of handmade things, and I can't wait to create tons of cute things for Baby Shock.